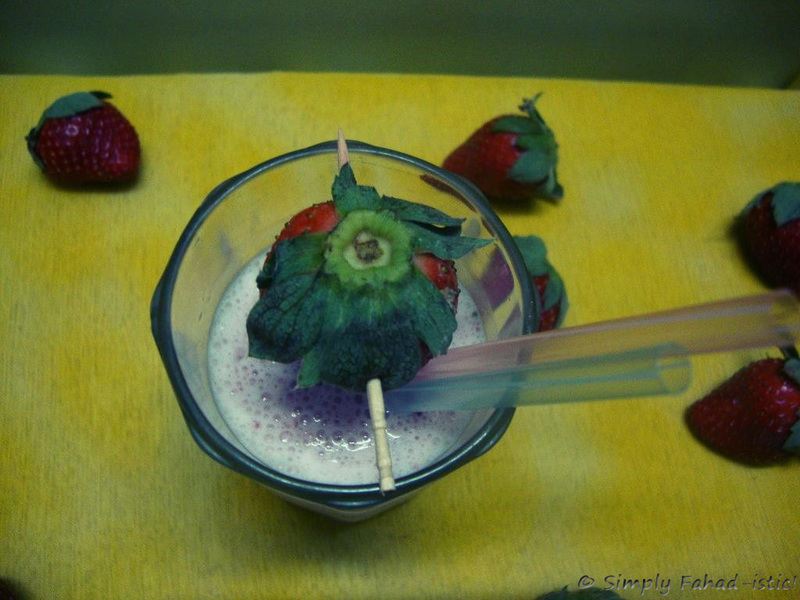 Liquid Friday: Best Strawberry Milkshake - Simply Fahad-istic! A meal of burgers and fries just does not seem quite complete without the accompaniment of a milkshake. Fresh,red strawberries,creamy vanilla ice cream and cold milk blended to make kids(Including the kid inside you!) go weak in their knees. This classical,immensely popular sweet beverage has been made so perfect that it cannot get any better! Mix the strawberries with sugar and keep in the refrigerator till serving time. At the time of serving,put all ingredients,including strawberries and the syrupy liquid they have released in a blender and grind them to a thick,blushing pink shake. Pour into a glass,and garnish with the remaining strawberry threaded onto a tooth pick over the glass rim. The ice cream in specified quantity thickens the shake,yet does not make it so sweet that the delicate sourness of strawberries is overpowered.However,feel free to raise its quantity if you wish for a thicker shake and care less about that tart hint. The strawberry milkshake does sound delicious ! This is really a delicious summer cooler recipe to make your family members delighted. This milkshake will always make you feel more calm and happier. It offers a perfect balance of flavors and an admirable consistency. Thanks a lot. One of my family's all time favourite. Love it.